The home and school was started by Bruna Colombo-Otten and Howlader Muhammad Akkel Ali in 2004. Bruna was first introduced to Ali on a visit to Bangladesh whilst seeking a charitable project to support. Their aim was to set up a community catering for every kind of disability, in which the children would benefit from living together, helping each other, learning together and supporting each other. An empty property was rented from the organisation Interlife Bangladesh and the WOD Trust (Welfare for Orphan and Disabled) with trustees from the Barisal Technical College was established. Ali brought together a group of orphaned and disabled children and young people and moved in. Together they turned buildings which had been uninhabited for thirteen years into a basic but habitable home. Bruna and a group of Swedish friends financed Bhola Garden for the first three years. At the end of 2005 Bruna met Dinah Wiener, a literary agent, in London. 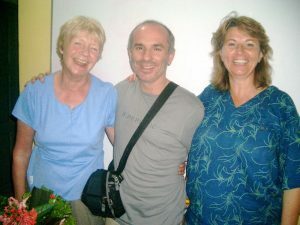 Dinah was interested in visiting Bangladesh thanks to Anne Hamilton, author of A Blonde Bengali Wife, a travel memoir about her time spent in that country. Dinah and Bruna travelled to Bhola in November 2006. The outcome was a decision to buy the existing property, and to set up a charity and raise money so that the orphaned and disabled children could continue to be assured of a happy and secure life. In 2008 Dinah funded the purchase of waterlogged land behind Bhola Garden. The ponds have been infilled and now, after six years of dispute with neighbours about the boundary, the surrounding wall has been built. Also in 2008 Bruna and others funded the purchase of land at Valumia, 10kms away. There are fields and fishponds. A tube-well was installed and, in 2011 a small house was built for the caretaker and his family. Fruit-trees have been planted. Nets have been set over the ponds for beans to grow on. With this land the home and school are now not just self-sufficient in fruit and vegetables apart from rice but are producing a surplus for sale in the market. They breed and catch fish for their own consumption, and there is the possibility of other livestock. So Valumia is now a fully-fledged training centre for horticulture, aquaculture and possibly, in future, animal husbandry. In 2009 the new children’s hostel and kitchen were completed raising the residential capacity to nearly 100. In 2010 half the pond at Bhola Garden had been infilled to provide the site for a new building. This was built between the infilled pond and the existing classrooms. It provides boys’ dormitories, a tailoring room, accommodation for married staff and guest rooms for Bangladeshi visitors. In 2015 accommodation for the director and his family was built on the roof. Also in 2010 another piece of land, 10 minutes walk from Bhola Garden, was purchased so that, if needed and when funds permit, a rehabilitation training centre for handicrafts, metal and woodwork could be built in place of the existing tiny shack at Bhola Garden. 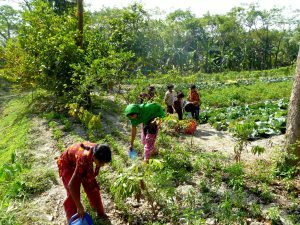 The land is called Supari Bagan, which means Nut Tree Garden, and is full of nut trees. The nuts are harvested and sold. For much of his life Ali worked with orphaned and disabled children. From 1970 to 2004 he worked with the Swedish Mission, an NGO, on Bhola, but his experience was far more personal than that. 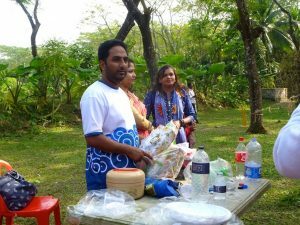 Orphaned himself at age eight, he knew what it was like to be in institutional care (in Bangladesh the term “orphan” can apply to any child without someone who can afford to look after them) and had long seen the added stigma of disability. Traditionally, care arrangements and building facilities for disabled people tend to concentrate on one kind of disability. Usually there is one school for the deaf, one for the blind, one for those who are mentally impaired, and so on. Likewise there is one group of medical specialists and one lobbying group/charity dedicated to doing the best for that one disability. Ali saw the possibilities of bringing the different disabled categories together into a mutually supportive group where they could all help each other in their daily lives, learn from each other and thereby learn to feel wanted and useful – and above all have fun. For this to work they needed a common means of communication – so everyone was, and is, taught sign language (including the blind!). Another example of the inclusivity of the community is demonstrated in Ali’s determination to teach all the children to swim, both for therapy purposes and as a basic life skill on an island with so much water. Blind and deaf children playing water polo with those who have cerebral palsy is an interesting sight! The aim was not to provide an institutional home or permanent refuge but to turn round the children’s lives and equip them to live in the community with dignity. That might include medical operations e.g. for a cleft lip or club foot, manufacturing assistive devices, classroom education, training in life skills and training in work skills, or training for other family members in looking after the disabled child. After three years most children are expected to return to their families or communities to make room for others. But if they are not capable of transferring to mainstream school at that point, they can stay and receive training in employable skills ­ tailoring, farming, woodwork or metalwork. In his eight years as Director, Ali had remarkable success in turning his ideas into practice and creating a solid foundation for Bhola Garden. Winning the confidence of the families with disabled children – who were often hidden away out of family shame – and persuading them to seek help was (and is) a challenge. Slowly, the community became known as the place to bring a child with a cleft or other disability. At that time, Ali was arranging cleft operations for children who were perhaps five or ten years old. These days, in the wake of such awareness-raising, some of them are brought to us soon after birth. Not only can they receive the operation much earlier (at 6 months for a cleft lip, 12 months for a cleft palate) but in the meantime the mother can be helped with, for example, advice on breast-feeding techniques. Similarly, it was important that deaf children were identified before they started school. At mainstream school they would fall behind their age group very fast, whereas at Bhola Garden, where everybody signs, they progress by leaps and bounds. Thanks to Ali, Bruna and all our early supporters, Bhola Garden is now established. 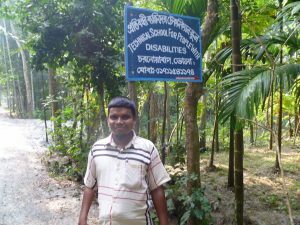 Ali has now retired, and the new Director together with the local trustees of BCSB (Bhola’s Children Special-School Bangladesh), are applying for National NGO status. Zakir is in his late thirties, married with two small daughters. He speaks fluent English, having studied in Australia where he has a diploma of Business Information Technology from Sydney Institute of Science and Technology. He is also a BA from the National University, Dhaka. His work experience included advertising, project management and programme consultancy in various organizations before joining the Acid Survivors Foundation, where he was head of planning and development until 2014. We were extremely fortunate that Zakir felt like a change just as we were looking for a new Director. He had known Ali, Bhola Garden and several of the staff for many years. In November 2014 he came to live in Bhola Garden before Ali’s retirement.